Imagine you have worked for many years, and finally will be able to retire soon. Imagine feeling as healthy as ever. Imagine you notice a lump protruding near your navel, so you go to your doctor, and after having a simple scope done you are diagnosed with less than a year to live because you have mesothelioma! What course of action would you take if chemo and radiation were not at your disposal because of the placement of the tumor was in too dangerous a position? Would you simply give up and let the cancer bury you without a fight?? Below is what one courageous man did when he was put shoes very similar to the above. Our organs have a membrane that surrounds and protects them. It is called the mesothelium. Each bodily organ uses different names for the mesothelium: For the lungs it is called the pleura. For the abdomen calls it is the peritoneum. For the heart calls it is called the pericardium. When the cells of the mesothelium abnormally divide without control and order, a rare and deadly form of cancer called mesothelioma ensues. James Rhio O’Connor is a man who valiantly struggled to the bitter end in order to vanquish the mesothelioma which showed up in his pleura. He was diagnosed with at 61 years of age after having been exposed to asbestos earlier in life. The oncologist gave him less than one year to live, and suggested that he take his wife on a cruise and then come back and basically succumb to the cancer. Instead of caving into the cancer, Rhio (he went by his middle name) refused to sit back and let it decimate his body and end his life so quickly. He enlisted a team of professional clinicians, made many decisions about what types of treatment (using both conventional medicine and alternative medicine) to utilize, and thus began his 7-1/2 year regimen to not just prolong his life, but to live it to its fullest despite the mesothelioma death threat hanging over his head. Hearing of Rhio O’Connor and his struggle and indomitable spirit is nothing short of humbling and inspiring. I had heard of this rare form of cancer on the local news, as many in the area who have been exposed to asbestos have also fallen victim to this deadly disease. But to read of this one man’s relentless pursuit to educate himself on various therapies and surround himself with a top notch team of various clinicians, all to not let his death from mesothelioma be in vain is remarkable. He interviewed countless patients and researchers; he did hours upon hours of studying about the disease and the treatment options and their effectiveness, etc. From all of his efforts he had a regimen of hundreds of supplements, changed his diet radically, and made many extremely difficult choices. His efforts proved successful. Researching this disease online via www.survivingmesothelioma.com (for a more detailed background about Rhio’s struggle see the latter website) I was floored at the insidiousness of mesothelioma. As opposed to most other forms of cancer, this one does not have much in the way of symptoms to tip you off that you have it, not until it is at a late stage. Plus the symptoms that it eventually gives are not the most helpful, as they can often pertain to many other diseases, which could lead to the medical professionals scratching their heads if they were not aware that the patient worked with or near asbestos. Also confounding is that there is a percentage, albeit small, of those who have never had known exposure to asbestos, yet still have contracted the deadly cancer. The majority of cases of mesothelioma begin in the pleura or peritoneum. Often the culprit is long term exposure to asbestos. More men than women are afflicted with this cancer, and it mostly shows up in older folk, but no one is immune to the possibility of it striking them. Equipped with this background of the disease from my online research, and having read excerpts of Rhio’s book, They said months. I chose years!, how he carved out alternative methods to destroy this foe, much of what he did resonated with me on multiple levels. I began to compare the steps he took versus what I would do if in the same shoes. If I am ever diagnosed with this form of cancer, or anything terminal I cannot say I would be half as valiant as Rhio by any stretch of the imagination. But the one thing I would have in common with him is doing intense research as to what the disease entails, and what treatment options, what varied therapy approaches are out there. 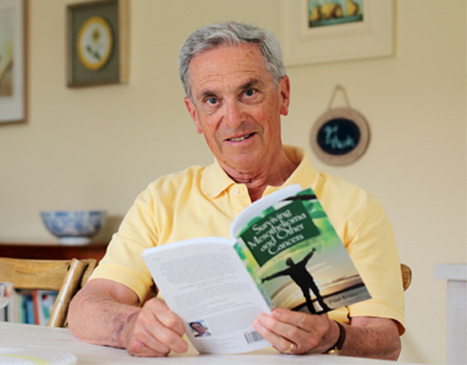 For the past 30 years I have tended to take a more alternative approach to health and medicine, and so if ever in the throes of a terminal illness I would not waver in that aspect. But I also have a high respect for the clinicians of conventional medicine, and would want to tap their knowledge base as well. My best portrait would be to have an oncologist to consult with, and a certified naturopath/nutritionist. In addition I would contact Cancer Treatment Centers of America, as they integrate both conventional and alternative treatment options. They drive home a convincing philosophy that YOU are their full focus if you become a patient of theirs. With these resources in hand, I would then weigh out the side effects, long term possible damage, and seek out which methods seemed most effective. My preference would be to limit the amount of man-made chemicals being used, and opt instead for nature’s bounty of nutriceuticals, whether vitamin, herb or other based supplement. Discussions with the oncologist and naturopath would have to eventually coalesce into a set of treatments that comported with each other, and see if either specialist had any objections to. That aspect might not be easy to pull together, as often the conventional medicine community does not respect the alternative medicine community, and vice versa. Since 1995 I have been an avid fan of the Internet and the ease of research done online. So my first step in research would be to do a general google search and read multiple websites, hoping for commonality on the main portion of causes, treatments, and diagnosis/prognosis front. Then I would also use medical search engines, which has web search ability specific to the disease, forums for support and further knowledge, news that you are querying on. As my battle waged on, the progress or regress would also dictate if change in one direction or the other should be made in attacking the illness. Again, I would have my specialists to consult, and I would highly lean upon my family, friends, and pastors for their advice as to whether they agreed with my decisions, and the diagnosis/prognosis. I would hope to have enough family and friends who could assist by doing some research, along with networking with others who have the same illness in order to exchange information and co-labor in the healing process. Going back to Rhio and his resoluteness to not give in to the cancer, to not just take a cruise with his wife and call it a life, but to hunt down every option, to keep a positive attitude, and to fight till the fight was over is something everyone of us can learn from and aspire to should the “C” word ever coming knocking on our door. Rhio knew that nutrition and health go hand in hand, and that conventional treatment is not always the answer. He did not have many other survivors from the past who took the course of action that he did, so he was a pioneer of sorts, and I so respect him for the courage and determinism to do so. May all who read of his battle be thus motivated to not lay down and die without giving it their all.